. Published on April 20, 2017 . 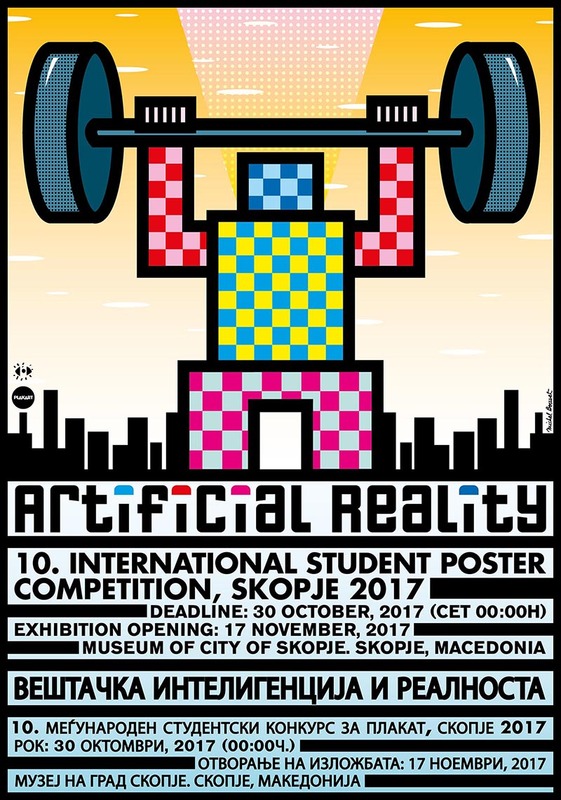 PLAKART in partnership with Museum of City of Skopje announce the competition of 10. International Student Poster Competition, Skopje 2017. The project is carried out with support by Ministry of Culture of Republic of Macedonia, AUG Design from Czech Republic and several external associates and design projects from Poland, Czech Republic, Turkey, Serbia, Germany, USA, Russia. Is Artificial Intelligence our Reality? Artificial Reality. Artificial Intelligence (as stated in the Encyclopedia Britannica) is the ability of a digital computer or computer-controlled robot to perform tasks commonly associated with intelligent beings. The term is frequently applied to the project of developing systems endowed with the intellectual processes characteristic of humans, such as the ability to reason, discover meaning, generalize, or learn from past. Technology is ruling our lives, killing our imagination. We experience difficulty in enjoying human, spiritual pleasures as conversation, art… This state of absorbency with technology is supposed to get more serious not only in terms of influence to our personal future but also the business environment. Major worldwide media are recently informing us about the new challenges regarding the increasing role of the computer-controlled robots which has influence on the global map of employment and is re-shaping the human labor market structure. This issue has become important topic for the business elites, political leaders in the past year… Davos World Economic Forum has chosen Artificial Intelligence to be one of the leading topics at this year Summit. “To say that globalization is bad because it destroys jobs is a very short cut for something that needs far more analytical work and understanding,” IMF chief Christine Lagarde said. Producing more inclusive development is one of the main global concerns. International Monetary Fund is consequently alarming that wealth redistribution is a global issue. Two alternatives are presented: Artificial Intelligence in favor to eradicate poverty and strengthen the middle class or creating a favorable environment for the wealthiest to become even richer. In regional context jobs are outsourced and manufacturing being relocated, employment is decreasing as a result of digital computer or computer-controlled robots replacing human labor. All students on BA, MA and PhD studies of fine arts, design, visual arts, are invited to enter the 10th International Student Poster Competition until 30 October, 2017 (CET 00:00 hours). This year the Council of International Student Poster Competition decided to put accent on the issue of the Artificial Intelligence. Students are invited to do their creative work, make buzz and create messages that will inspire many, to engage maybe few but to contribute to raising the awareness of general public, but mainly to policy-makers and business heavyweights.